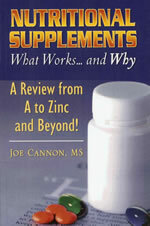 Joe Cannon has devoted over a dozen years to investigating the effects of dietary supplements. Nutritional Supplements What Works and Why discusses not only the advertised claims of 119 dietary supplements but compares those claims to what the clinical evidence actually says. That way you lean the real facts. The book also contains over 900 references so you can look up the facts for yourself if you like. Never again will you wander aimlessly through the health food store wondering what works. YOU WILL KNOW! Unlike most other books on this topic, you also learn about the side effects that only doctors usually know! Research also finds that some supplements may have positive effects that most people have not heard of. You get that information as well! The result is an unbiased, easy to read review of today’s most popular supplements. After reading this book you will know more about dietary supplements that most people on Earth Guaranteed! Joe provides accurate, concise information in an easy to understand format. It is the first place I turn to for reliable supplement information. I strongly recommend it to patients and athletes, as well as health and fitness professionals. An honest and fair review of the confusing world of supplements. Joe Cannon, has put together a must have resource for every serious athlete and anyone wanting to live a healthy lifestyle. This is an excellent review of the scientific literature covering a very comprehensive list of supplements. Joe has managed to write an easy to read, common sense book in the sea of supplement confusion. This information-packed book will surely remain on my desk as I work with my clients. A MUST read for anyone using or desiring to use supplements. Clear, concise and easy to read this book is loaded with the essential information that is needed by everyone interested in sports nutrition and supplements.